In recent years, high-profile medical device failures have garnered significant media attention. The delays in recognizing safety issues with metal-on-metal hip replacements, cardioverter defibrillator leads, and other implantable devices highlight systemic shortcomings in how the safety of these products is monitored following market approval. The current system of postmarketing safety surveillance for medical devices in the US primarily involves the Food and Drug Administration's (FDA) adverse event reporting system. Manufacturers and device user facilities are required to report serious adverse events leading to injury or death to the FDA. Patients and providers are encouraged to report adverse events, but such participation is voluntary. This system has significant limitations, as data are often incomplete, adverse events are significantly underreported, and the denominator of total patients exposed to the product is unknown – making it difficult to calculate a device's failure rate. Such data shortcomings have made it extremely challenging to quickly identify and address medical device issues in US patients, as illustrated by the identification of hip replacement problems much sooner via Australian clinical registries than by the American system. In order to help improve device safety surveillance, Congress passed the Food and Drug Administration Amendments Act of 2007, which required the FDA to establish a unique device identification system to more accurately pinpoint devices with performance or safety issues. 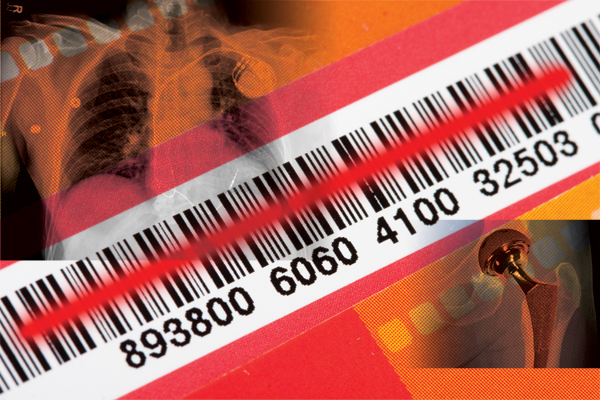 When the Act is fully implemented, all medical devices will be labeled with a unique device identifier (UDI) in a human- and machine-readable format. Although the Act and its corresponding rule addressed the format and assignment of UDIs, the regulations fail to establish a UDI capture or reporting mechanism. There has been widespread industry support for the use of the UDI to improve patient safety efforts and postmarketing surveillance. All healthcare stakeholders agree that UDI data must be collected, monitored, and analyzed to foster accurate and timely device surveillance. However, the most effective way to accomplish this task has been the source of significant industry debate. In June 2014, Pew Charitable Trusts submitted a change request to the Accredited Standards Committee (ASC) X12 – a standards development organization responsible for creating and maintaining electronic administrative transaction standards – to have the UDI added to the electronic claim transaction. The rationale was that the addition of the UDI to medical device claims would allow payors and the FDA to track data in a large-scale, longitudinal manner. During the discussion of this proposal, health plans have identified additional uses for UDI claims data, including payment modeling and the creation of device formularies. Many industry stakeholders, including the AMA, have voiced significant concerns over the proposed addition of the UDI to claims because of inadequate safety surveillance capabilities, increased provider burden, and reduced patient access to devices. The addition of the UDI to the electronic claim would not meet the regulatory intent of improved device safety monitoring. Addition of the UDI to electronic claims presumes that health plans are equipped and willing to collect, store, analyze, and transmit critical device safety data. However, health plans lack the capabilities and incentives to assume this new role in postmarketing safety surveillance, as they are not required to share adverse event data with the FDA, manufacturers, or researchers. Additionally, health plans maintain information on their current customers, but this relationship traditionally ends when a patient transitions to a different insurance carrier. Robust safety surveillance would require tracking of patients throughout their lifetime, as current contact information is needed to update patients on any device recalls or other information. With patients routinely changing health insurers due to employment changes, rate changes, or the annual enrollment via the Affordable Care Act's health insurance exchanges, a device surveillance system reliant on health plan data sources would be inherently flawed and potentially dangerous for patients. To be effective and protect patient safety, a UDI tracking system must be able to capture data for all patients. In addition to this suboptimal approach to safety surveillance, the addition of the UDI to the electronic claim presents significant and undue provider burdens. If the UDI were to be added to the claim, it would require healthcare providers to connect internal systems to move UDI data into their practice management systems. Meaningful Use Stage 3 includes the UDI as a data element in the physician's clinical electronic health record, but this information would need to be transmitted between the provider's clinical and billing system for inclusion in the claim. Additionally, the claim traditionally just includes information that is necessary for adjudication. Because the UDI is not directly tied to or required for adjudication, the addition of this data element opens the door to other extraneous information being added to the claim. The inclusion of such information is problematic because it jeopardizes the "clean" claim submission process. A mistake in UDI information – a reasonable possibility for a data element with up to 87 characters – could result in a pended or denied claim, thereby resulting in additional work for both the provider and payor to resolve the issue and an unnecessary disruption to a provider's revenue stream. Finally, the AMA has significant reservations about the other uses of UDI data identified by health plans, including as a mechanism to limit a physician's discretion to use the most appropriate device for an individual patient (and perversely undermining patient health outcomes). Moreover, any health plan assessment of device performance would be strictly based on the plan's narrow patient panel, which may not accurately reflect the experience of a broader patient population. As a result, available treatments would be limited and potentially based on health plans' financial interests, rather than device efficacy, safety, and appropriateness for an individual patient. With the addition of the UDI to clinical EHR systems as part of the Meaningful Use Stage 3 regulations, the AMA believes additional resources should be put into developing surveillance systems using EHRs and clinical registries. Unlike the addition of the UDI to a claim, including the UDI in the EHR would place the identifier in the context of the clinical information necessary for a complete understanding and evaluation of device performance. Inclusion of the UDI in the EHR would also serve as a practical single data capture point that would facilitate multiple data uses and information exchange. For example, practices could answer health plan requests for UDI data by sending an electronic claim attachment generated from the EHR. Additionally, usage of an EHR system to capture UDI data would ensure that relevant information stays with a patient, regardless of any health plan enrollment changes. Finally, implementation would not create the additional burden and potential revenue disruption that might result from the addition of the information to the claim. Ultimately, healthcare resources are limited, and the industry needs to maximize return on investment and create a device safety surveillance system that will result in optimal outcomes for patients. Due to the flaws and burdens associated with adding the UDI to the claim transaction, the AMA believes that patients deserve an effective way of tracking device performance, and that this will not be be accomplished by the flawed and burdensome approach of adding the UDI to the claim transaction. The AMA urges the FDA and the healthcare industry to focus on the utilization of EHRs and clinical registries to capture UDI data so that our technology investments will achieve meaningful improvements in patient safety. Founded in 1847, the American Medical Association promotes the art and science of medicine and the betterment of public health. Learn more at www.ama-assn.org.